A spirited selection as favors for any occasion, these angel candle holder favors will make a brilliant addition to your event tables. Each favor measures 2" x 2" x 2" and features a white frosted glass holder with a poured white candle inside. The holder rests in a round pewter colored resin base decorated with stars around its rim. 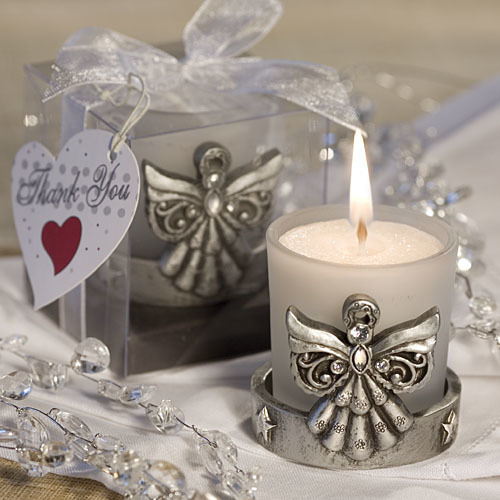 Extending up is an intricately detailed pewter resin angel enhanced with various shimmering clear rhinestones. Each is packaged in a deluxe clear topped box with a black base, tied with a white organza bow and attached heart shaped thank you tag.